So my 8 point Irish war band for Saga is now well under way. A good proportion of the troops have got some paint on to one degree or another, however no one is at a finished stage yet . Most of these just need highlighting and detailing work now followed by varnishing and finally bases flocking. The group of slingers up on the box are a stage behind and still need an initial wash to dull them down before highlights and details. One poor fellow is just recovering from some major re-constructive surgery on his hand as I chose to use plastic Javelins rather than the wire spears and the diameter was considerably larger making the drilling process quite hair raising! Fortunately only one casualty occurred. So far there is 1 point of Kerns, (Levy), 12 models in a point. 2 points of Bonnachts, (Warriors), 8 models in a point. 3 points of Fianna, (Hearthguard), 4 models in a point. The 3 points of 4 Fianna, (12 men in total), have been broken down into 2 units of 5 Fianna, (10 men in total), the other 2 will be upgraded to Curaidh, (Champions). They look great and arrived swiftly. Now I can get on with the long overdue task of equipping my war bands with shields ! So much to do ! The second unique feature of the Irish in Saga is the ability to upgrade 2 of your Fianna (Heathguard) figures to Curadh (Champions). So these were the next figures added to my Irish war band. The chieftain in the centre has thus far only made the table as a N.P.C. The big fellow at the top is from Reaper Miniatures which I picked up in the UK from Miniature Heroes and was originally bought for use in D&D. The rest of the figures came from Crusader Miniatures. The first thing I did when I decided to start playing the Irish in Saga was purchase one of the speciality units that the Irish can field, war dogs. Initially they went on the table with my welsh forces, who were now, temporarily, subbed as the Irish, whist I built up and painted my new troops. The dogs replaced my mounted half guard in my new war band. War dogs are played as Bonnachts (Warriors) with some differences in movement and armour. With the long movement of mounted troops, they are able to move through uneven terrain with out penalty, they do have a lower armour but if you load them up with the right dice and abilitys and the dice gods are on your side they can be devastating ! I picked these miniatures up from Northstar Military Figures who kindly put a package together of the right number I needed for Saga. A Seiðmaðr was a Norse shamanistic sorcerer a male practitioner of Seiðr. I don’t play any Norse War Bands so this character will be a story catalyst. I’m really into the idea of multi world campaigns at the moment, with various magical practitioners opening portals into different realms, possibly even played across multiple tables of terrain simultaneously. I’m hoping this is something I can explore in Dragon Rampant if not then I guess I’ll have to start looking at developing my own rule set. I think he’d make a good wizard for a Frostgrave party also, although I already have mine set aside ready to paint. This figure comes from Hasslefree Miniatures. A group of 4 mounted Teulu (Hearthguard), one point for Saga. Astride their sure footed mountain ponies, they thunder down upon the Saxon invaders. Used as hit and run troops with the right dice and abilities these guys can be deadly ! Although they often end up as suicide troops in my battles, as their armour is greatly reduced for being mounted and armed with javelins, so you have to get it right ! A unit of mounted Teulu and A mounted Warlord played as a Teulu. I wanted to do some thing different for my mounted Welsh Warlord. More on that in a later post. 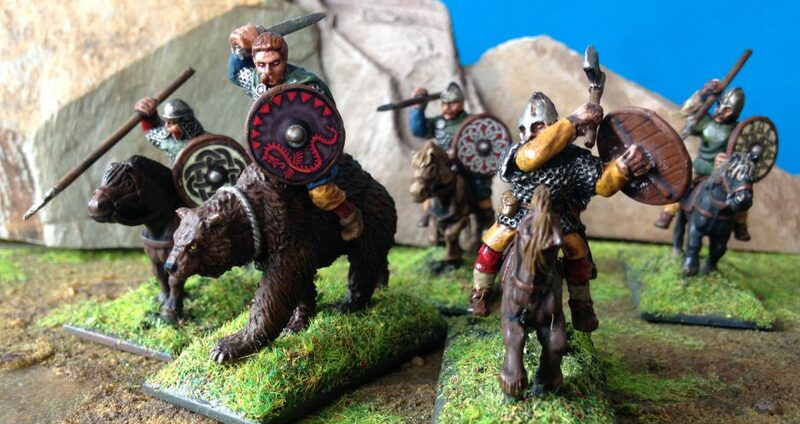 The Saxons are Gripping Beast plastic Saxon Thegns. When I first started playing and was short of figures and money they used to stand in as a unit of Welsh Teulu. At the foot of a towering wicker man druids have gathered to summon a dark aspect of the mighty Cernunnos the horned god. In a desperate, last ditch, attempt to drive blood thirsty invaders from their lands. Cernunnos comes flanked by standard bearers and musicians from the realms of the dead as the druids open a door to the underworld to destroy their enemies. In the distance astride a bear and under the guidance of Merlin flanked by some of his bravest warriors Arthur rushes to prevent them finishing their incantations and close the portal before the very order of time and space are ripped asunder ! The druids are from Warlord Games: Hail Caeser range. With the addition of one further model from Ral Partha . Cernunnos and his attendants are from Brigade Models: Celtos: Fir Bolg range. Cernunnos, Standard bearer, Musician, Musician (mounted). I got all four of them in a blister pack which was really good value from Rochester Games Models and Railways which is where indeed I get most of my supplies from. More on Arthur and his warriors in a later post. Saga: Age Of The Wolf. Warband and first impressions. Irish Kerns (Levy) f… on Back at the Table.